Though it is half as old as Netflix, Apple's iTunes rental service is believed to be about one-tenth the size of the competing rental service, one analyst has projected. 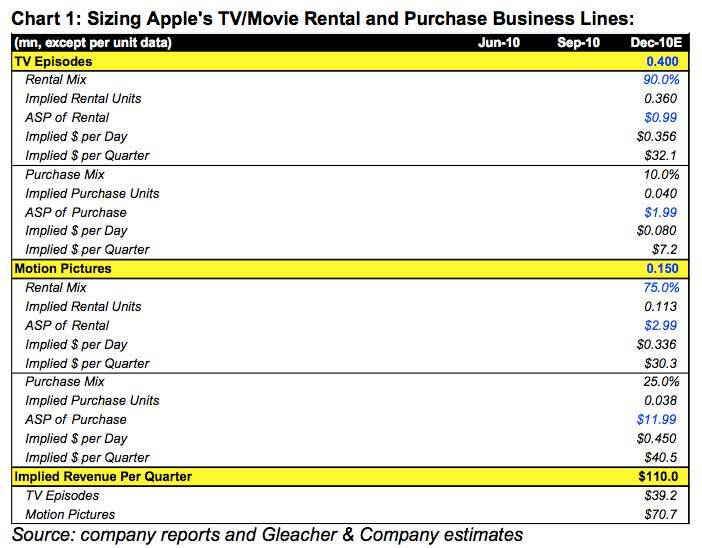 Analyst Brian Marshall with Gleacher & Company said Wednesday he believes Apple sells about 475,000 rentals daily through iTunes, compared to the 5.1 million daily rentals seen by Netflix. iTunes TV and movie sales began in 2005, while Netflix first launched in 1999. Marshall estimates that the iTunes rental business for TV shows and movies is larger than sales of purchases. He estimates that rentals generate more than $60 million in revenue per quarter, while purchases account for about $50 million. For comparison, Netflix reported revenue of about $550 million Sept. 2010. Last week, Apple revealed that its streaming-centric $99 Apple TV had already sold 1 million units in its first three months of availability. It also said that iTunes users are renting and purchasing over 400,000 TV episodes and more than 150,000 movies per day. Marshall believes that roughly 90 percent of iTunes TV viewings are 99-cent rentals, while 75 percent of movie viewings are rentals with an average selling price of $2.99. Applying those estimates to Apple's provided numbers results in a daily total of 475,000 rentals. If Apple can grow its rental business at the same rate as Netflix, Marshall believes annual TV and movie rental revenue from iTunes could exceed $1 billion within 5 years. Assuming Apple keeps about 30 percent of that, it would be another $300 million per year for Apple's bottom line. Right now, he estimates that Apple earns $110 million in revenue per quarter from rentals. About $70.7 million of that would come from movies, while $39.2 million would be TV episodes. The new Apple TV has represented a shift for the company's iTunes business, as it pushed studios to allow 99 cent rentals of TV shows, rather than costlier permanent purchases. But some studios have been reluctant to participate, calling Apple's 99-cent model too inexpensive.